My plane landed early in Newark Airport. Jim and Charlie and my parents had gone to Liberty State Park to ride bikes in what was bike ride #3 of the day: Jim had mentioned that Saturday I was coming home, whereupon Charlie started saying ‘Mom airplane’ and asking to go there right now that instant. Being in motion does help to pass the time. It’s good to be going somewhere, rather than sitting or standing around in the house, in stasis, and if you can ride by the Statue of Liberty, Ellis Island, and enjoy the vistas of lower Manhattan from across the Hudson River, why not? The spring rolls were long finished when I saw the white car pull up to in front of Door 2 at Arrivals in Newark Airport. I ran over and opened the back door. So good to see everyone! My dad was sitting in the back, my mom in the front passenger seat, and, while I could certainly squirm my way into the back, Charlie told me ‘no’ when I started to get in. And then asked to get out. I figured, why not and Jim shrugged. I handed my backpack to my dad to put in the back of the white car and Charlie and I went into the terminal. We walked past the baggage claim carousels and up the escalators. We stood around for a bit and I started walking toward the down escalator. Charlie said ‘no’ and we stood around for a few moments before I attempted to walk again towards the down escalator. ‘No’ Charlie said again. I pointed to the up escalator and Charlie started walking towards it, so up we went, to the Departures floor. We stood around for several more moments before I started walking towards the down escalator. Charlie again said ‘no’ which, by this time, I was kind of expecting. There’s more than one way to get out of an airport fortunately. I texted Jim who (along with my parents) was, sure, enough, still waiting at Arrivals. He said he’d drive around and then up to Departures and could we wait. As you know, we have stayed quite far away from airports and, too, airplanes, of late. Airports are none too friendly sensory- and otherwise—sounds, noises, people hurrying around with luggage of all sizes and kinds and worries about being late, missing connections, etc.. Saturday, Charlie seemed interested in looking around, especially in the direction of the line where Security is, with all the scanners and machines. Was he remembering standing there (sometimes for quite a long time) as we waited to go through the line and be on our way to the gate for a flight? After a few minutes, I started the starting-walking-thing again, towards one of the doors outside. Charlie followed me and as I pushed open the big glass door, I thought about how, a couple of years ago, this would have been so weird, me walking in front of Charlie in a busy public place with lots of people coming and going, all without holding his hand. I could hear him making an ‘uh’ sort of sound at repeated intervals, like the bass line of some ensemble piece of music. It’s been many years since I held Charlie’s hand, or rather since he let me hold his hand. and a sort of invisible tether seems to have grown between us— though if we had been going further and there had been more people, I would have been walking more beside Charlie, to keep him in my sight. I saw the white car, listened for Charlie, walked to it, and opened the back door. I started to get into the back seat. As my dad was the lefthand side, that meant that I would be in the center and Charlie was already saying ‘no’ to that. So without further ado (and because I was getting kind of tired of hanging out in Newark Airport which is not the nicest, most aesthetically pleasing, friendliest, etc. 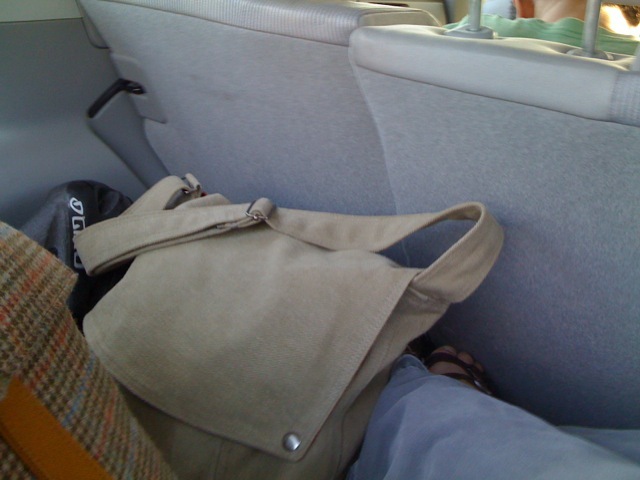 of places), I climbed over the backseat and into the back of the white car. Charlie got right in beside my dad and homeward bound we were (don’t worry, we don’t live that far from the airport). I had, alas, had to leave the Critical Autism Studies without hearing the last two papers, to catch my plane. I had dined Friday night with both presenters (both are graduate students working towards their Ph.D.s) and learned that one is also an occupational therapist, and the other had worked with older autistic children and adults in residential schools in Canada. The latter presenter’s paper was entitled ‘“We Just Couldn’t Manage” – How Mothers Discursively Organize their Talk About the Placement of their Child with Autism Outside the Home’ — a topic that I have had quite a few things to say about in the past few years. Yet it also seemed not surprising that it was just as the presenter of that paper was about to start speaking that I found myself grabbing my bags and heading for the door. It was a fabulous workshop and has, perhaps and maybe, given me a sensor of direction about my book/longer term not Internet-based writing project about Charlie. I’ll have a lot more on that to say but for the purposes of this blog entry, I’ll note that Charlie had been anxious all day Saturday. His wanting to walk around the airport was, I think, a sort of transition exercise/ritual/process; I especially noted his wanting to go up to the Departures floor: To go to where one goes to leave? To check to see if a place he has not been to in a while is still the same? Once home, Charlie asked to watch videos on YouTube. I showed him how to use the iPad for this and he said ‘no’ and asked for the videos again. The YouTube app interface on the iPad is very different looking from that on a regular computer and Charlie and I went through several rounds of ‘no, no.’ He was smiling throughout it all and, after 20 minutes, he watched a few minutes of one video (with the three children in the puddling pool). 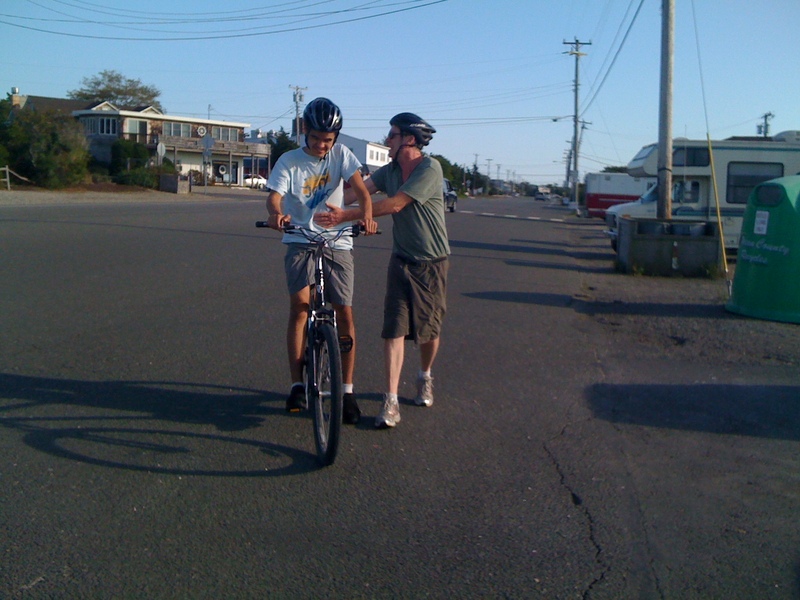 Then he called for a bike ride, followed by a generous snack (a plate of Chinese rice noodles, chung fun, plus watermelon and the ubiquitous Saltines) and teasing my parents by saying ‘no’ and laughing and grinning delightedly when they asked him to do this and that little things. (My mom and dad were quite in on the joke.) And then, while Jim went to see his friend, Charlie went up to bed. There’s nothing like the view from the back of one’s own car, you know?